I hate to admit this, but I purchased the set of dies, Tropical Thinlits, really based on just one of the dies, shown in the card below. 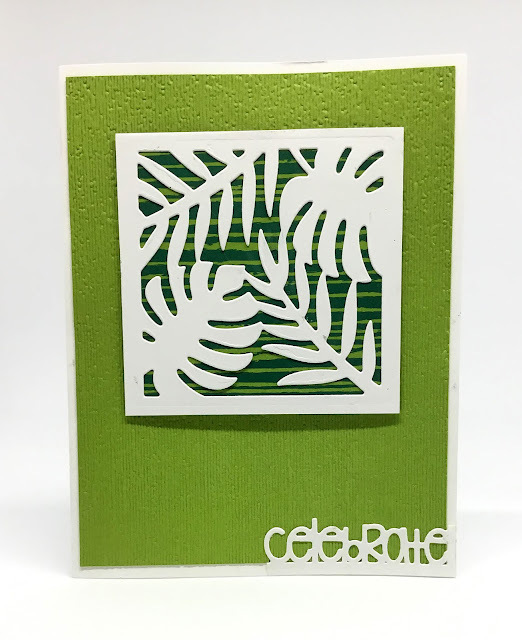 I thought that square of fairly intricate tropical leaves was just the best thing ever and couldn't wait to create with it! PLEASE NOTE: Since I got this die set, I have fallen in love with every single one of the dies. Now, I don't feel so guilty about my initial reason for ordering it. Because I use them all! At last month's Stamp-In, the girls created this card. 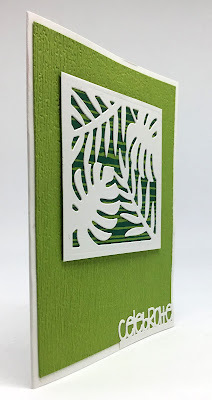 Although the photo makes the embossing look a little weird, it looks great in real life; but the background cardstock, in Granny Apple Green, has been embossed with the Subtle Embossing Folder (page 223 in the Annual Catalog). As the name of the folder implies -- Subtle -- that's exactly what it does: adds simply elegant subtle embossing. The little square of DSP behind my favorite diecut is from the Tropical Escape 6" x 6" Designer Series Paper stack, found on page 191.
it gives just a hint of dimension. Great for going through the mail! If you keep on reading, you will find the tutorial for making this simple card. 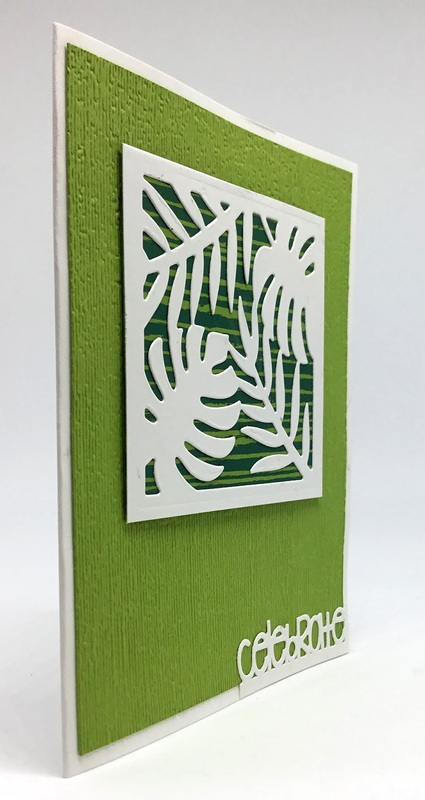 Run a 4" x 5 1/4" piece of Granny Apple Green cardstock through the Big Shot inside the Subtle Embossing Folder. Adhere this to the card base. Run a 3" square piece of Whisper White cardstock through the Big Shot with the square thinlit of leaves. Adhere the 3" square of two-toned DSP to the back of this piece. Mount the finished piece to the card front, with even margins at the sides and the top, with Stampin' Dimensionals. 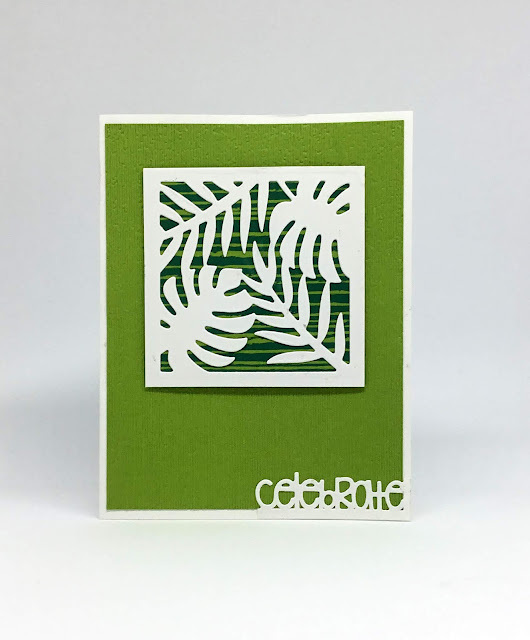 Snug your chosen sentiment, cut from Whisper White cardstock, into the lower right corner of the green portion. Adhere it in place. Definitely feels tropical! love it! Thanks for sharing at the To Grandma's House We Go DIY, Crafts, Recipes and More Wednesday Link Party! I pinned this! Hope to see you again next week. Thank you, Sheri! I really liked the feel of it too. Definitely feels like a tropical paradise! Thanks for sharing it with SYC. Aw, thanks, Jann! I just love that die and the coordinating paper. It makes it so easy and fun to create!